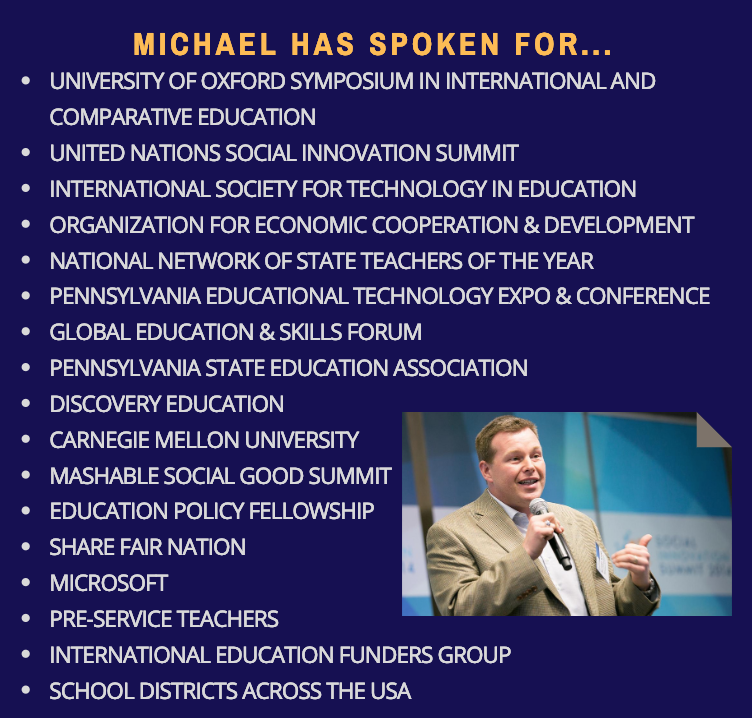 I have spoken to groups of educators, businesspeople, philanthropists, and policy makers around the globe. My keynotes and workshops are inspiring, engaging, and practical. Your group will be empowered to affect positive change right away. Each of these offerings can be adapted or customized to meet the needs of your group. Just let me know what you need. As the world becomes increasingly technological, our students will be faced with new ethical and societal challenges. We must teach them to to both identify and solve the unique and unforeseen problems in their future. 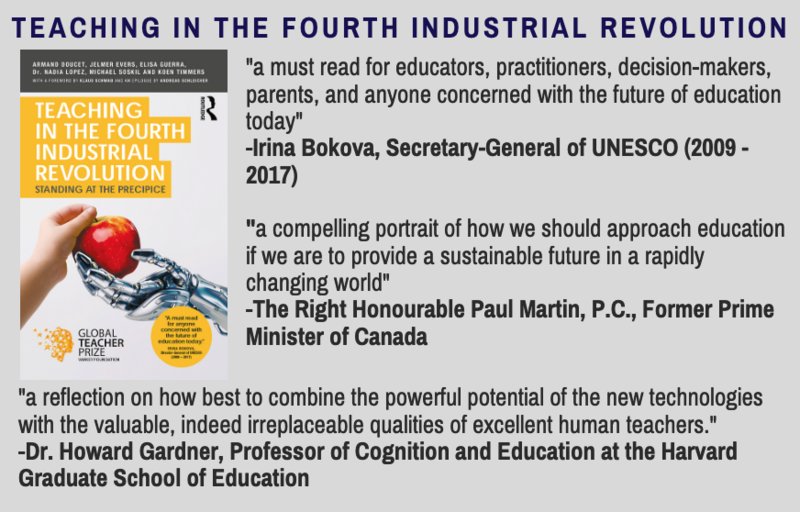 This keynote explores ways teachers and schools can develop socially conscious problem solvers that prepare for both future careers and a global, technological world. The world and our workplaces are becoming more globally connected. Almost every job will require global competencies and understanding. In order for our schools to remain relevant, we must provide opportunities for our students to learn with others who come from different locations, different backgrounds, and different cultures. In this keynote, developed out of a talk I gave at the United Nations Foundation Social Good Summit, I'll show how leveraging free tools makes it easy to bring the world into classrooms, engage students, and also increase learning outcomes in required curricular areas. Nothing is more important in our schools than each member of our community knowing that they are respected and that they matter. By focusing on relationships and a culture of empowerment, we can improve student outcomes while also helping teachers and students find their passion and purpose. This session focuses on balancing the content we have to teach with the social-emotional needs of our students. Whether we are teaching students or building bridges between the school and community, narrative allows us to connect with others on an emotional level. In this keynote, we will explore how using narrative and storytelling can make you a more effective communicator - whether you are working with students in your classroom, collaborating with colleagues, or trying to advocate for education with policymakers. ​Most teachers have been taught to start with the curriculum and find interesting ways to teach it. What if there was a better way? By reversing that model and starting with exciting learning experiences we can motivate students so that they cannot wait to be in our classes. In this keynote, I'll share how embedding the required curriculum into those experiences will make learning Motivating, Organic, Relevant, and Experiential. Not every teacher needs to be in a leadership role, but every teacher needs to be a leader - in their classroom, and in their profession. In this session participants will learn how to build networks for professional collaboration, how to use research and data to drive decisions, and how to advocate for both student learning and the profession. Many of our school mission statements indicate that we want our students to be lifelong learners. We cannot expect that to happen unless we are modeling lifelong learning for them. Participants in this session will learn how to take ownership over their professional growth by building networks in and outside their school. If we want our children do develop the capacity to be good citizens, we must give them opportunities in our classrooms and our schools to practice citizenship. This includes strategically giving them agency and autonomy over decisions that are made. This session will show how we can give students ownership over their learning while still ensuring that the curriculum is being met. We will be sending our students into a world of artificial intelligence, biotechnology, and machine learning. As we prepare them for an unknown future, humanity and competencies like emotional intelligence, compassion, and communication will be paramount. In this keynote we'll explore simple ways for teachers to get started using Project/Problem Based Learning, STEM/STEAM, and Passion Projects to build important skills for the future. ​Each new technology that is developed offers us both opportunity for advancement and potential for increased inequity. As educators, it is important that we see the limitations to the data we use to make decisions. We must also be intentional in how we teach our students to use technology, social media, and data to ensure our future society does not fall prey to unintended consequences. In this keynote, we'll look at the new framework for technology integration in school that helps students become positive change agents in their communities. With computers becoming ever more powerful, some have suggested that teachers will be replaced by machines soon. Nothing could be farther from the truth. In fact, the qualities that make teachers so special are the very reasons why teachers are more important than ever in an age of Artificial Intelligence. 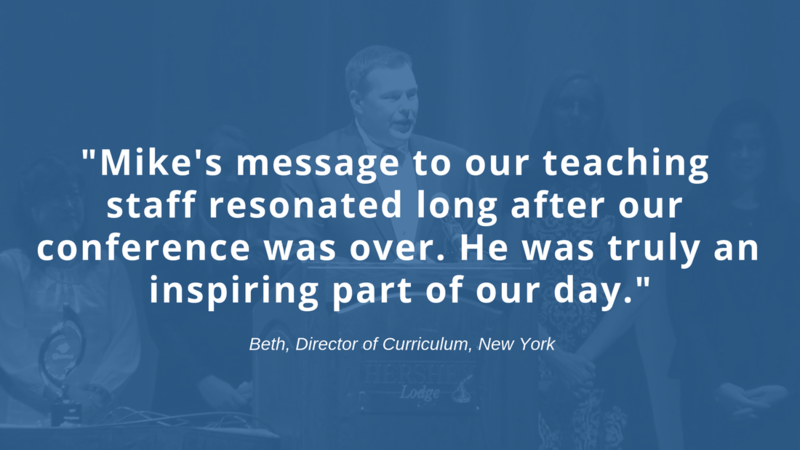 This inspiring keynote will leave teachers knowing how much they matter. It seems that "personalized learning" is all the rage lately. Yet, many times that term is used it refers to the impersonal practice of placing students on computers that use algorithms to determine their educational needs. Anyone who has spent time in a classroom knows that the way teachers build relationships and care for their students must come before content. In this session, we will explore ways that we can give every student an experience that meets their unique, personal needs without sacrificing the most important things that teachers do. How Can We Truly Meet Our School Mission Statements? Our mission statements should drive our practices in schools. Too often, however, we find it difficult to bridge the gap between our goals and our actions. This session will help everyone in your school community find ways to turn your school mission statement into reality through communication, design thinking, and team building. It's hard to imagine what the workplace will look like when our students graduate. We are educating students for an economy and workplace that will be heavily influenced by technological innovation. In this forward-looking session, we will examine how these trends will impact our students after graduation, and how our school programs can be better designed to properly prepare them for what lies ahead after graduation. Don't see what you are looking for? Any session can be adapted to meet your needs. Interested in having me attend your conference or speak to your group? Contact me here, or call Brenda at (620) 242-5265.